On the front left tail is the Wilson manufacturer’s tag with washing instructions. Attached is a flag tag reading the size “44 CARE ON REVERSE” with washing instructions on the back. 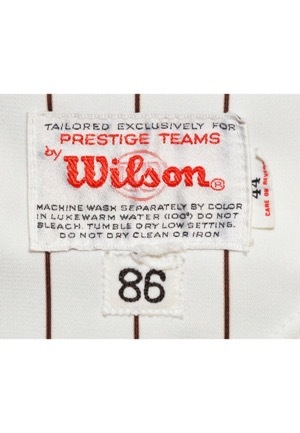 Adjacent below is a strip tag reading the year “86” embroidered in black. 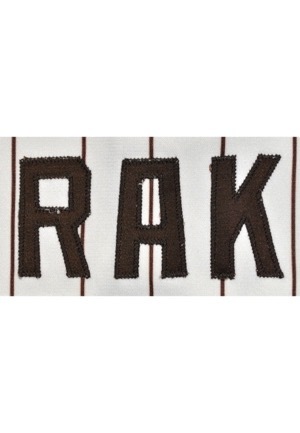 On the left sleeve reads “RAK” in brown tackle twill as a commemorative patch for their late owner Ray Kroc. 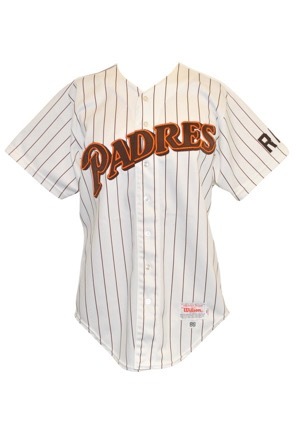 Across the chest reads “PADRES”. Across the back reads the player name “KRUK” sewn directly into the jersey. 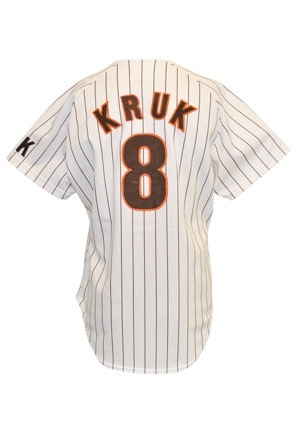 Below the player name is the player number “8”. All numbering and lettering is done in brown on orange tackle twill. This jersey is properly tagged, was presented to us as game-used and in our opinion shows excellent use.